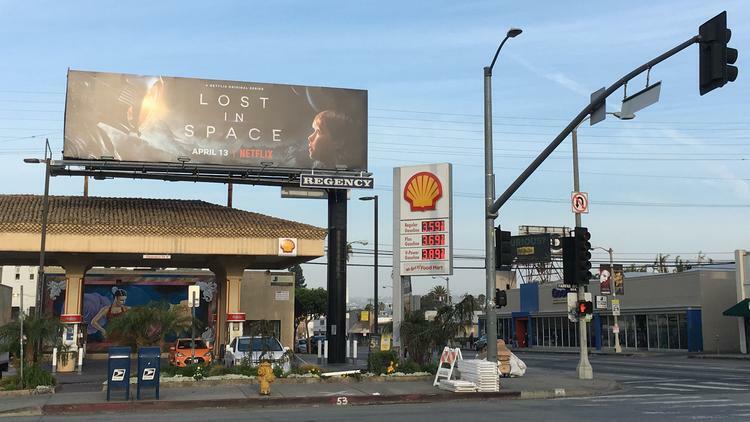 Netflix advertises its original programming on billboards throughout Los Angeles. Netflix Inc.’s marketing strategy for its digital programming includes one of the industry’s most traditional media: billboards. Now the streaming giant is considering cutting out the middleman and buying the outdoor marketing platform for itself. Los Gatos-based Netflix (NASDAQ: NFLX) has offered more than $300 million for Regency Outdoor Advertising, Reuters reports. The move would mark Netflix’s second — and likely largest — acquisition in its history. The company’s only other purchase was of Mark Millar’s comic-book publisher Millarworld for an undisclosed amount. Netflix is just one of the bidders for the West Hollywood firm, owned by Drake and Brian Kennedy, sources told Reuters, and the brothers could accept another offer. Regency’s billboards fill Southern California, with locations at LAX, on the area’s major freeways, along the Sunset Strip, in Westwood Village near UCLA and “in sight of” Edison Field in Orange County, where the Anaheim Angels play, according to the company’s website. The report on its possible acquisition falls in line with Netflix’s plan to increase spending on marketing this year. In a letter to shareholders in January, the company said it would boost its marketing budget by more than half from $1.3 billion to $2 billion.